I had high expectations, very high even, when entering Alinea in the surroundings of Chicago old town. Actually, to be honest, i booked this whole trip in the States just for going there (but don’t tell my wife please). 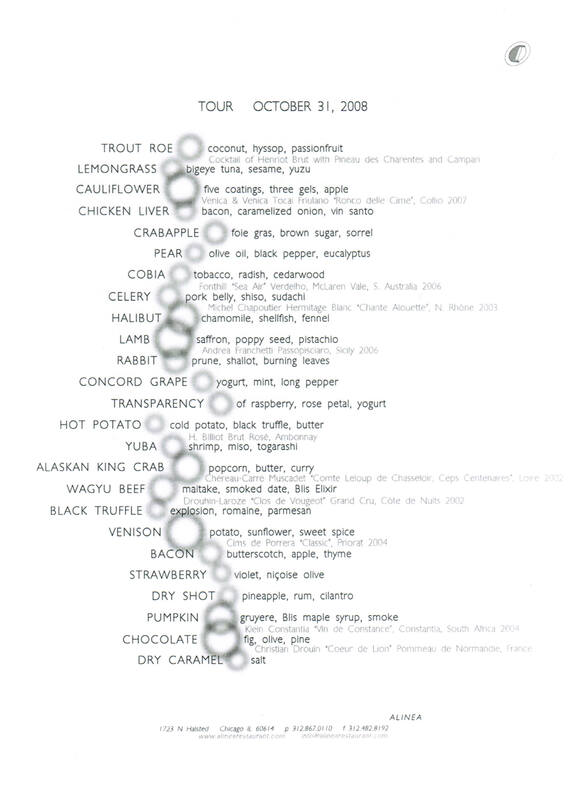 I also built all my other meals and flights based on this one at Alinea. So what can i say after spending 5 hours there ? That i probably never experienced such a global performance before, ranking this meal immediately in my top 3, together with the Fat Duck and Noma. These places can’t be compared, and i’ll not try to do it. They have one thing in common : you come out there with a smile on your face and the feeling of an intense pleasure that will thrill you days and days after. I succeeded to book a table 2 months earlier for this friday evening, around 9PM. Quite late but i secured my dinner knowing i was flying from NY a couple of hours ago and i didn’t want to take any risks. Actually, all went perfectly well and we arrived there fresh and ready as never. The entrance of Alinea is a little bit surprising. A dark house, a discrete entrance, a long hall with modern red lights, you do not see any door in this hall. Then when walking forward, an automated door opens on your left and you enter in the welcome hall. On your left and also on the floor above : the dining rooms, on your right : the kitchen and an impressive number of people in action there. We are seated in the small dining room on the left, at a nice and large square table for 2, nice intimacy, just 10 people in the same room, lovely. A totally delicate and modern atmosphere. No plate, no fork or knives on the table, just a small towel and a glass of water. We are then warmly welcomed by one of the personnel member in charge of this room, they were 3, including an extraordinary sommelier. And as from now on, we’ll just let us guide by the team, 25 fantastic dishes and wonderful small bites will be served in a perfect timing, paired with 13 different wines. We immediately started with an extremely good first dish. High quality of trout roes. I also enjoyed the cocktail, quite well balanced and not too strong. This second course (bite) is amazing. Delicate tastes, the products are placed on a thin lemongrass leaf, a chirurgical work, also in the taste balance. Rich in mouth with no dominant player … fantastic. I’m a fan of cauliflower. Ok, i know, sounds wierd, but i love cauliflower.. could eat that every day. So when appeared this dish with the vegetable in different textures, i was in heaven. Because the dish didn’t meet my tastes only, it was extremely well realized. Another great bite. Imagine how much time it takes to create this small bite, knowing how precise the tastes are. Stronger then on the previous dishes, it was really good and impressed me by the detail level of the realization. When i saw this sort of antenna with this small bite at the top, i asked me « how to eat that one ? ». Answer is simple : move your head forward, open your mouth around the bite and take it. Again, i was impressed by the accuracy of this small bite. Tastes were so subtiles, the presentation was so original and precise. I realize i was living one of my best experience ever. Of course, frustration can raise as these bites are a ‘one-shot’ tasting, but because of their ephemere existence, it increased my personal pleasure of eating them. I loved the material, no standard plates here, most of the dishes/bites are served using very original containers. This bite was of the same level as the previous one : explosive, tasty and so subtile. That dish could be one of the dish of the evening. This white bowl arrived on table, topped, then the waiter took out the top and you discover this small bite, raw fish, while some smoke is coming out and parfuming the table. The bite itself was wonderful. I’ll remember for long the taste of the fish there. This dish is suggested on the same approach as the previous one (without smoke). It was maybe the only dish (from the 25 we got) that was a level below, good, no more. This one is one of the higlight of the meal. A new dish created recently by Grant Achatz. It was simply extraordinary. A mix of delicate tastes, great products and clever textures. We are keeping the same quality and pleasure level with this lamb course. The saffran and pistachio are giving this dish a great dimension, strong tastes but not brutal. Even here, Grant Achatz manages to keep tastes so well balanced and even bring finesse and subtility thanks to the seeds. I loved it. The same dish once the glass (with an empty bottom) is removed. We felt this one arriving from far, before it reached our table… because of the smell of burning leaves parfuming our room. A finger food bite, totally original and more important : tasty as hell. Wow wow wow, no words to express our feelings here (again). This small bite was an explosion of tastes. And i really appreciated the intelligence of switching here with a fresher bite. Great. I remember i was loosing my words when trying to describe the feelings i had eating this dish. Cold potato soup, hot one topped by a truffle leave. It was amazing. And i really enjoyed the pairing with the rosé champagne. Not convinced at the beginning but i must say it worked well. Generally speaking, all the wines suggested here in the pairing menu were cleverly choosen. I clearly enjoyed the wine itself but also the moment where for each wine the sommelier came to us and explained in a very detailed way why they had choosen this wine. Guess what ? This shrimp course was very good. Finger food again. But always in a way that you feel the product behind some apparent modernity, and always in a way that tastes are putted forward. Brilliant. And while we are moving from dishes to dishes, our 2 little red flags are still there, the meat rising the dining room temperature. And here we are. 30 minutes after they brought us the 2 meat pieces at our table, we are now served this wagyu beef course. Under the meat slice, some mushrooms. The waiter indeed picked the meat slice and topped the mushroom with it. The meat remains raw and works as a ‘carpaccio’ except it has been warmed during 30 minutes in the room and slightly cooked by the warm of mushrooms and sauce. I must say i don’t like mushrooms a lot (except truffles 🙂 ) but in this case, i could eat everything and was totally thrilled by the beef. Amazing. And looking back to this course preparation, i was again impressed by their anticipation, the timing where all this happen. Fantastic. I was looking for my second breath, trying to find a way to come down to earth when this black truffle explosion course arrived. Geez, i couldn’t go down, i stayed in heaven. The picture doesn’t reflect the power and quality of this small bite but i can tell you that i’m still thinking today to this sequence of dishes i’ll never forget. This (magnificent) next course was of a very good level… probably i would have found this course on-site excellent in other circumstances. But after the kobe beef and black truffle explosion, it’s difficult for the next dish to exist. This one is doing well and when thinking back to this meal, i must admit it was even … excellent. Grant Achatz likes to play, and this small bite coming from space can testify it. On one thing bacon slice are « sticked » more things you can imagine. I wondered how they do that. These guys are in permanent research for accuracy and performance. Crazy. Oops : on top of that, it was tasty…. At this stage of the meal, you almost don’t know where you are (we received the printed menu after the meal). One thing is sure : you know that you are living something unique, watching and tasting a unique food performance. On the road to the desserts, this small paper pocket with some fruity powder : finger food again. Good. What to say… on a white pillow placed in front of you, the waiter brings the first dessert. Of course, the weight of the plate has en effect on the pillow and some smoke and parfume is coming out from the pillow itself. What a show. Funny ? … yes. But is the dish itsfelf at the level of the visual show ? Oh, of course, at the end, the pillow is totally flat…. no time for a little nap. In some restaurants, you end your meal with some light and fresh desserts, not here. Strong tastes, huge work on the textures (the performance is there to the end). I enjoyed it but not as the pumpkin dessert. Last small bite : some dry salty caramel. Funny indeed but also tasty. A nice end. What i’ll remember from this experience is 2 things : 1/ the pleasure i got eating all these dishes, each one being different from the previous and next one. You don’t know what to expect, you’re always surprised by something : a taste, a texture, a smoke, the plate visual itself, … 2/ the performance. Being able to deliver 25 courses like this in a perfect timing (i didn’t insist on that but the timing between the courses was perfect) is a great performance. Performance also in the detail level in each dish : there is a considerable amount of work for each single bite there. And there was no failure. Not even a small one. So, at the end of this meal, words are unecessary. At least to me. My single remaining objective was to meet and thank Grant Achatz, the 27 years old chef. My wife and the welcome hostess aranged it and while we were almost out, he came to us and kindly greeted us. I congratulated him for this extraordinay meal and was given his book, signed by him as souvenir. Lovely. Outside Alinea at this hour of the day (2 am), we were quickly brought back to reality : Halloween night, crowded streets, people shouting and fighting for a taxi. War time (almost). But nothing could hurt or break our happyness. We did it and will never forget it. We’ll even try to redo it in the future. Hopefully. Our second NY dinner was planned at Eleven Madison Park, the day after WD-50. We arrived on time (8pm), and were facing the beautiful entrance. How many guests are eating here ? Once comfortably seated in a small square table located in a corner of the huge dining room, our dinner can start with a glass of champagne from Henri Goutorbe, Cuvée Prestige, from Ay and some delicous amuses. These amuses were really excellent. Not exceptional, but excellent. Fresh, tasty, crispy. Very good start. We of course decide to select the Gourmand Menu, a 12 courses menu, with wine pairing for me. The dining room is beautiful and huge indeed with high ceilings. The flowers decoration reminds me the Cinq in Paris in some way. The atmosphere looks more strict of course than WD-50, but very cosy and enjoyable. The service was also quite strict and highly distant at the beginning but we managed to have some talks, and a couple of hours later, the ice was broken and we enjoyed nice chats with the guys taking care of us. Back to the menu, a 12 courses « surprise » menu, they asked us if we had some allergies or products we didn’t liked, and also asked if we would like to add some Alba truffles on one dish… we said yes. Excellent first dish. The ice cream was fantastic : subtile taste, sweet, matching really well with the cream and the caviar. Some pure molecular but now classic dish here : we were told that the cheese was coming from one of the best regional US producer, and i must say it was really tasty and excellent. One of the highlight of the meal ! Great product quality, tastes were extremely well balanced and the overall freshness was really appreciated. Another highlight of this meal : the pairing with the pineapple can be surprising but after first bites, it works perfectly well and even sounds logical. The brioche and small emulsion served besides were terrific as well. The cooking of the gnocchis was great. Overall, this dish was very good but not exceptional. The truffles came in a small box, and they grated some slices on our dishes. The smell was there but it was really not tasty at all. Later on when paying the bill, we’ll discover they have priced this extra truffle course at 180$ for the 2 of us. Hum. What to say. Just trying to forget it. Fortunately, the next dish came on table and this scallop course was excellent. A very nice course, not only from a visual perspective. Strong tastes, perfect cooking, maybe the best dish of the menu to me. For the next fish course, i never managed to get the detailed course description as the printed menu they gave us at the end of our evening was wrong on some dishes. Ennoying but no that much as this course was probably the less interesting one of our meal. Same description issue for the next dish, we didn’t get the right description (and i didn’t ask for the good one when i realized it some days later – shame on me). The previous fish course was OK, no more, while the last one here above, was really good again. Fot this last dish, we enjoyed a nice burgundy wine : Jacques-Frédéric Mugnier, Clos de la Maréchale, Premier Cru, Monopole, Nuits-Saint-Georges, 2004. 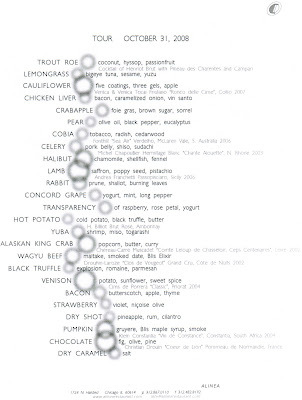 A word about the wine list : one of the best i’ve seen recently. They said that wine is also their expertise, hard to check on evening only, but at least their wine menu is impressive and of high quality. Excellent dish. I appreciate the cooking of the lamb, the whole components working well and offering a great pairing with the wine. American cheese again, i loved them. Very interesting. My preferred dessert without any doubt. Second time i have malted preparation for a dessert (after my Ledoyen lunch) and this was one was as good as the one we got in Paris. Good dessert, nothing exceptional but good. We left EMP around 1am, pleased with the evening we had. The wines we got were diversified and of an excellent quality level. The service appeared to be extremely professional and efficient, maybe too « mechanic » at the beginning but much more relaxed and friendly at the end. We appreciate it and thanked them for that. The meal itself was of very good level. More « classic » and less creative of course than WD-50 but generally speaking, the dishes were working well : very good quality product, a great work is done on the tastes too. Except this truffle story, we experienced a very nice dinner and i would go back there for sure, and not only for their fantastic wine list. That was our second and last meal in NY, moving the day after to Chicago and looking forward to Alinea. Days, no : months i was waiting for this foodie trip coming true. And for this first meal on US soil, i had booked a table at WD-50. WD-50 was of a high priority for me in New-York. Based on the reviews and pictures i’ve seen since a couple of years, i definitely wanted to try it. After this meal, i must say that it was good, sometimes very good, but didn’t meet 100% my expectations, and actually, WD-50 is the most special restaurant of this level i’ve ever seen. This is not negative at all, it just means it is special. Location, food, wines, atmosphere, service… they were all different here from what i’m used to live. The place is located in the south-east NY area, no huge buildings there, small streets where actually you couldn’t expect to find such a famous restaurant. Yes, famous, as the chef, Willy Dufresne is quite well known in the food world, for his appart cooking, for his creativity. The entrance of the restaurant is hard to find, located in a small house in a middle of popular street. Once you get inside, the feeling is more to have entered a trendy bar. Surprising but we liked the atmosphere : extremely relaxed, nice welcome. Small problem : there was no table ready for us at 8pm (and i was hungry as hell). We are suggested to take a seat at the bar and start to look at the wine list and menu. An excellent cocktail for my wife, a sherry for me (what a great wine list by the way, i encourage many french restaurants to give more attention to the by the glass wine selection they suggest, often too small and classic). 20 minutes later, we are seated in the middle of the room, with a small view on the kitchen (as you can see on the picture, tables of 2 are quite close from eachother). We go of course for the full tasting menu, combined with the wine pairing menu for me. Good introduction. A pity that this soda taste was not matching the rest to me. Very good. Soft and sweet tastes. Crazy textures. We loved it. Excellent again, and surprising as little pieces are hidden inside the soup. Was almost ready to order another one. Another good one. Original tastes with this grilled pork above the raw scallops. A dish where you have to eat all components together and then it reveals its potential. Again, interesting textures for pure tastes (the yolk texture was amazing). A the begininng, it seemed to be the best dish of the meal, but then this cinnamon taste is appearing from nowhere and it didn »t work 100% to me. Very interesting as it is the first time since many meals i’m submitted to so many questions, issues : why this ? how to eat this one ? why this taste pairing ? Can’t comment this one as i hate banana. Too many strong tastes in the same plate here for me. The cooking of the duck was perfect. Each component here is great but they don’t work together for me here (in opposite to the scallop where you HAD to eat it mixing all tastes together). While discussing with one of the waiters, i learned from him that the people seated at the table next to us were from Alinea, and Grant Achatz himself was sitting there in front of me. Funny knowing i’ll be there 2 days later. Small world, even here. This one was at the end the best dish of the meal. 3 tastes (maybe the reason), no more. And just excellent. This could be a Pierre Gagnaire dish. Except the banana, it was excellent again. Fantastic dessert, the brown butter ice is one the best thing i’ve eaten in a dessert. Huge. At the end, i must say i enjoyed it, but not 100%. I found the dishes delivered here sometimes too complex, from a taste perspective. Playing with textures is funny and when done appropriately, i’m totally OK. Playing with tastes is more risky. On 2 or 3 dishes here (hamachi, crab tail, duck), it didn’t matched my personal tastes, and i couldn’t understand how the dish was working. One thing is sure : the food is totally unique in a sense that creativity is there everywhere and more than in all places i’ve been before. Tastes are clear and strong while the chef dares a lot of strange/new/disturbing pairings. The desserts were fantastic, maybe the best one we got during our stay. The atmosphere at WD-50 is really different from what you can experience in France but i liked it. At the end of our meal, we were invited to meet the guys in the kitchen. 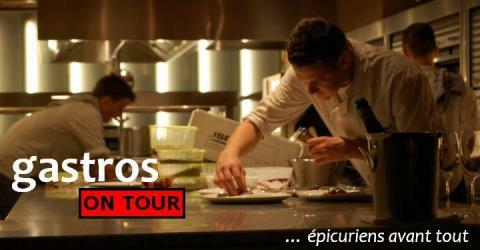 We thanked them for the meal, and met the pastry chef, Alex Stupak, who was working at… Alinea before ! Told you, small small world. A few words over the service : young guys, doing a great job, no ties, no suits, delivering great explanations and transmitting with knowledge and passion the dishes and wines offered to us. Really enjoyable. It was a good start to our stay, the cheapest meal we did at the end, i would like to try it again, maybe in a better shape and choosing some « à la carte » dishes in order to review or confirm my impression. We were the last « normal clients » to leave the restaurant, leaving the team with the Alinea table. Some minutes later, i litterally felt in my bed, for a huge sleep. Tomorrow is another day, with another dinner scheduled. Stay tuned. … à New-York et Chicago. Ca laisse des traces… de fatigue, de surcharge pondérale (no comment), … et surtout d’images plein la tête et de saveurs plein les papilles. Deux villes différentes mais tout aussi attirantes. Avec de belles rencontres et de magnifiques moments à table et en dehors.